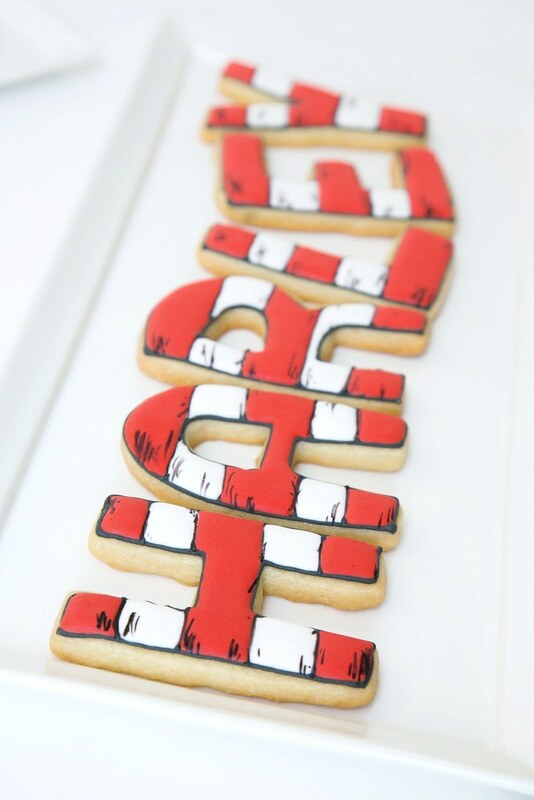 Dr. Seuss Baby Shower Cookies! I made these cookies for a Dr. Seuss themed baby shower, which my friend Britt planned for her sister-in-law. Britt had an adorable Pinterest board going with all sorts of Dr. Seuss themed ideas for food, decor, etc. that she shared with me. She used various books for the party inspiration, not just one. I thought that was really clever and allowed so many more possibilities for creativity! She asked me to do cookies for the dessert table and said I could use pretty much any book or character, except maybe One Fish, Two Fish as she had some cupcakes planned for that. Thing One and Thing Two and Cat in the Hat were good candidates for my cookie inspiration. 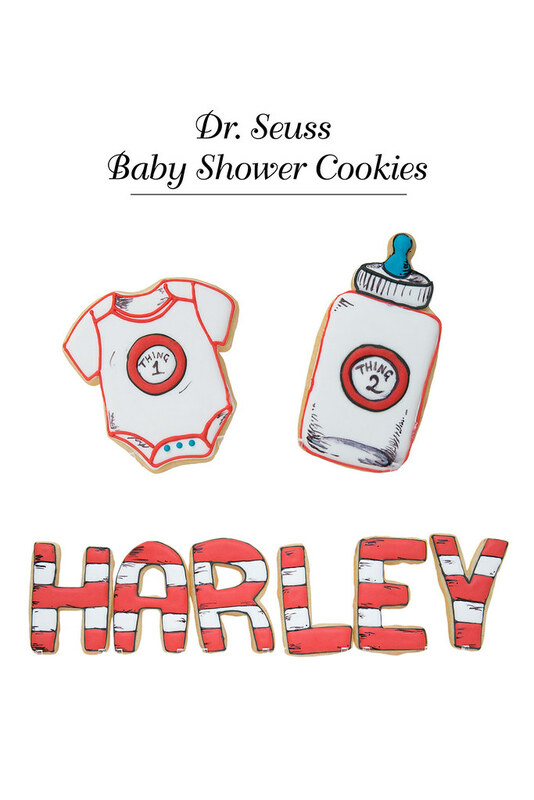 The only "thing" I was trying to avoid with Thing 1 and Thing 2 cookies was implying twins, as the shower was just for one baby boy, to be named Harley! (Side note: It's kind of nice knowing the baby's name in planning things like this for a shower, I must say.) So, that brings me to what I ultimately came up with. Thing 1 Onesie Cookies and Thing 2 Baby Bottle Cookies! I thought if I did baby items, like onesies and bottles, as the respective things, it was less twin-suggestive and more like "baby essentials". 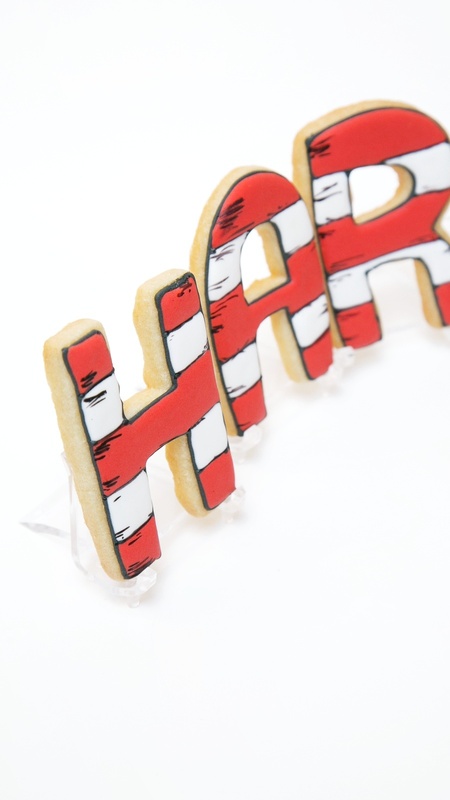 Then for the Cat in the Hat inspiration, I went with the very recognizable hat design (red and white stripes) for letter cookies, to spell out the baby's name. To give all of these cookies a really authentic Dr. Seuss touch, I tried to incorporate the shading style he uses (black lines). Emphasis on tried. I'm no Dr. Suess, but it was fun (and a little bit challenging) trying to guess how he would shade a baby bottle and onesie. I got major clues for the bottle by looking at the fish bowl from Cat in the Hat, actually! It was a delicate balance trying to not over do the shading and keep the cookies looking clean & consistent. I think it all came out pretty good though. Here's a whole board of "things" I used for design inspiration.